Business & Baby on Board has been named one of Australia’s most innovative products, in one of the largest and most audacious innovation awards of its kind in Australia – the Anthill Magazine ‘SMART 100’ Index. The business book written by Tasmanian entrepreneur Johanna Baker-Dowdell was not only ranked in the SMART 100 Product Winners, but was also ranked 16th in the Readers’ Choice list. Here’s your chance to read an exclusive excerpt. As you read at the beginning of this book (if you’ve read chronologically), I was living the business mum dream. I was running a full-time business doing something I loved, had my family close by and had the lifestyle I wanted. I couldn’t think of how my life could be better, until it took a turn for the worst. I thought I had everything pretty well under control in my business until I had an accident in April 2010, which resulted in a head injury and stopped me working for three months. So what do you do when you run a solo business and you earn the family income? Panic! Yes, there was an element of that, but it didn’t help anyone, so I chose to learn from this experience and came out the other side more aware of my strengths and wiser in business. My speech was affected and eyesight blurry. The brain I relied on so much was failing me. I spent four days in hospital going through MRI and CT scans, numerous neurological and physical tests and speaking with a social worker before being sent home to rest, and not stress, as I was now a post-traumatic migraine sufferer. It took a month before the constant migraines subsided enough for me to be able to look at a computer screen and do some work. I started with one hour a day in the first week, then two hours the following week and so on until I was back to a full-time workload three months after the accident. Those three months were very difficult for me as I struggled to come to terms with the fact a migraine could crop up at any moment. My confidence took a nosedive. I started questioning my abilities until I realised I still had everything I’d had before the accident (well, the bank account wasn’t in the same shape, but everything else was still okay). After spending the time recovering and giving myself a stern talking to, I was able to look back at the accident and reflect on what – and who – were really important to me. My head injury became a defining moment for me, and I’m almost (I say almost) grateful it happened. It made me realise that life is short and I need to live it now, not some time in the vague future. I looked at my business with a more critical eye, and my husband and I made a decision to follow our dream to have a hazelnut farm in Tasmania. Without the bump on my head, we would probably have still been talking about doing it. The events of 2010 made us really question what we wanted in life – and then act on those goals. I learned many lessons as a business owner during this time and was forced to change my work practices as a result. The biggest lesson was the importance of systems in business. If I’d had systems in place before the accident I could have handed it over to someone else, feeling confident Strawberry Communications would run without me. Instead, I worried about losing clients and the quality of my work to the detriment of my health. Nothing is worth making yourself sick over! The first step in systemising my business was to make a list of tasks I did not have to do. This included my bookkeeping, invoicing and administration. I found a virtual assistant and a bookkeeper I trusted and outsourced this work to them. Between us, we worked out how each task should be completed and when, and then I relaxed knowing someone capable had taken control of that area in the business. Next I worked out which tasks I was doing that could be outsourced to a contractor with a similar skill set to mine. I wrote a procedure for each task, with step-by-step instructions and screen shots detailing how everything should be completed to the same level of service I would provide. I completed this process over time, so each procedure was written as I completed the task. This way I knew I wasn’t missing any steps. These documents will form part of the Strawberry Communications operations manual once I document everything. So now I am left with the more strategic tasks that I should be doing for my clients. This process has freed me up to spend more time doing this and work on marketing the business itself. Another hard lesson to learn was the importance of adequate insurance cover, especially if you are running a business on your own. I had applied for income protection insurance and was being assessed when my accident happened. Of course it was turned down at that time, which meant my family had no income for the time I was ill. If you are running your business alone, it means you are on your own when it comes to business insurance and liability. You are taking all the risk yourself, so it pays to research which insurance product is right for you and your business. If you work from home, you may be able to cover your property, office equipment and stock under your home and contents insurance, but it pays to make an appointment with an insurance adviser to check the best option for your circumstance. Public liability insurance is equally as important as covering your equipment and stock, because it covers you for any damage to property or people, other than employees, caused by you or your staff. Professional indemnity insurance protects business owners, especially those considered experts in their industry, against claims made by clients, past or present. Claims usually involve a breach of conduct in their professional duties and the insurance covers the costs, legal expenses and any damages payable. I decided to be upfront with my clients when I couldn’t work, knowing I would lose some. A friend helped me send out an email as soon as I was able to string a few sentences together to tell them what had happened and give a time-frame for when I would be able to complete their projects. These updates continued via email, social media and my newsletters until I returned to work normally. The clients I valued stuck by me and waited patiently until I was able to continue my work for them. These clients are still with the business today and have formed an important cornerstone in my operations. In the day-to-day running of a business it can be easy to forget that clients are people, too, and sometimes they just need to know what is happening. If they appreciate what you are doing, they will reward you with their loyalty. I know a lot of business owners, particularly in the service industry, who said yes to everything that came their way at first, even if it wasn’t exactly right for them. I was guilty of this to a certain extent as well, but not anymore. My head injury and subsequent time out of the business to recover made me question why I was working on some projects and with people who didn’t fit with my business vision. It doesn’t help you, your business or the client if your heart isn’t in it, so it’s best to say thanks, but no thanks, in these situations. Have the confidence in refusing and your business will thrive as a result. Don’t think too long when you have an idea. Follow your dream and make it happen. Be flexible around how your business operates because it will change over time, as your children grow and due to circumstances beyond your control. Outsource so you can free yourself up for the big opportunities. 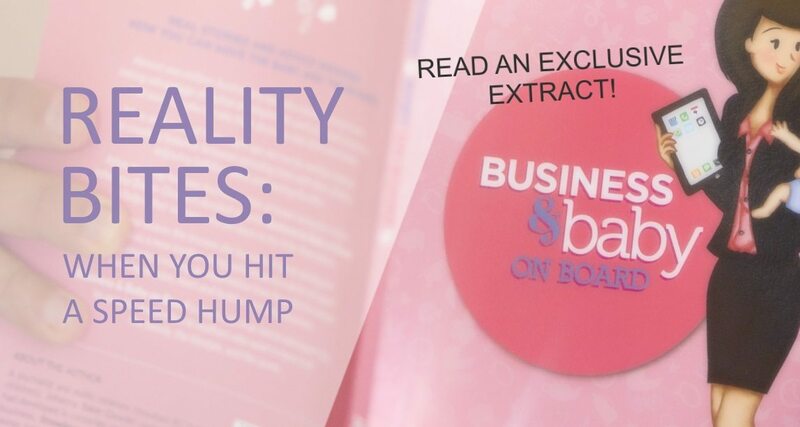 This post is an extract from ‘Business & Baby On board’, a mum’s bible on starting out and succeeding as an entrepreneur. The book is available for purchase from here. Have you had reality bite and affect your business? Leave a comment below. 0 responses on "Reality Bites: When You Hit A Speed Hump"